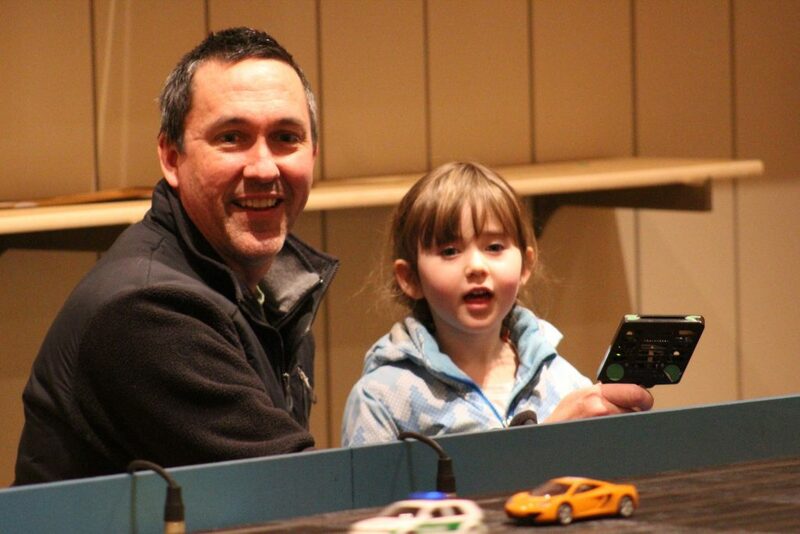 BRUNSWICK — Hanna Lincoln-Astle, 3, watched open-mouthed as her dad, Jay Astle guided a police car slot car, lights flashing, around the track with lightning speed, finger easing off the trigger as on the curves, letting it go full speed on the straights. 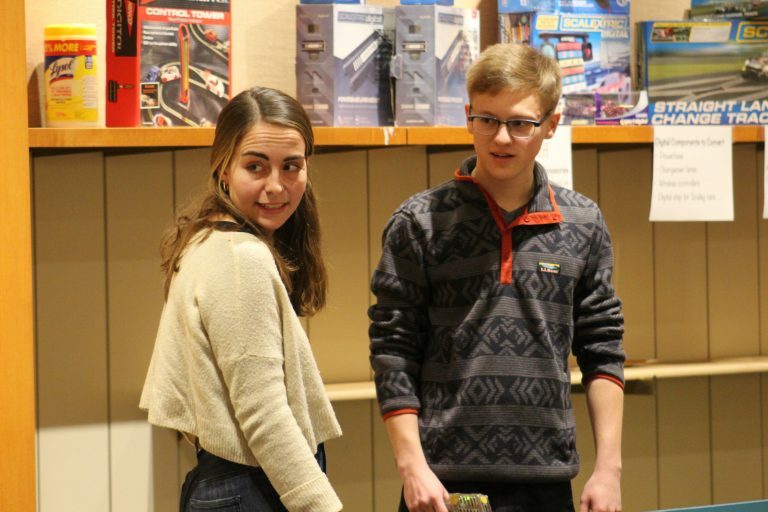 The pair had just stopped in to look around at Slot Car Junction and Fascination Station Toys in Merrymeeting Plaza on Saturday evening, but ended up staying awhile when Oskar Matero, 21, and Maeve McGowan, 20, also stopped by for the first time, and challenged Astle and his police car to a 15-lap race. Matero, a Bath resident, used to have a small track to play on when he was a kid, he said, but nothing like the 56 foot long, 12 foot wide one at Slot Car Junction. McGowan, who was admittedly somewhat dragged along, laughed and said she had fun and that it was something she could see herself doing with her nephews. On any given day the six lanes will be filled with grandparents, grandchildren, teenagers and strangers. Piffath and co-owner Jeff Cooper have been at the Merrymeeting Plaza, 147 Bath Road location for just over a year now, and are meeting new people all the time, Piffath said. A Brunswick business for a decade, the shop was previously located at the Tontine Mall, which made it harder to draw people in from off the street. Now, with more space for toys, plenty of on-site parking and the ability to create their own hours, Piffath said they are right at home, and even have plans to add a small cafe to their space. The two also own H2Outfitters on Orr’s Island, a venture through which they often take international kayaking trips with customers. Years ago they would often bring back small toys from their travels to Italy, Costa Rica, Iceland and other places, and “Jeff has a passion for wandering in and striking up a conversation” with people, Piffath said. Before long, slot cars, the small powered cars guided by a groove in their tracks, which are hugely popular in Europe, she said, and which Cooper loved as a child, were on their radar, and the two were curious to see if there was a market for them in Maine. Evidently, there was, and 10 years later they are still going strong. Next weekend there will be an interest meeting to sign up for a kids’ racing series or a child and parent series. Another more serious “no magnet” group, which takes the magnetic field helping the cars stay on track out of the picture, also meets weekly. I believe they're Maine's only surviving raceway. I like long walks, especially when they're taken by people who annoy me.